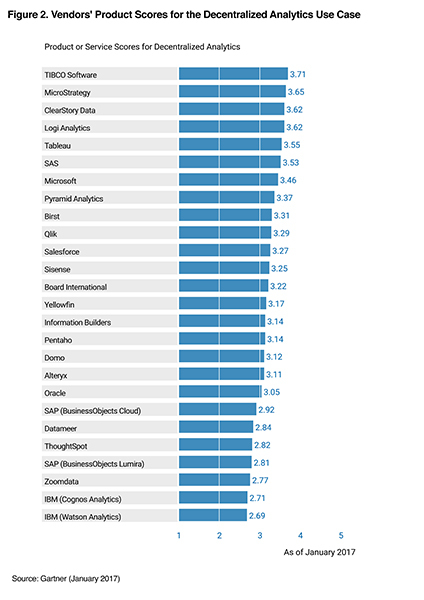 Gartner BI & Analytics Critical Capabilities Report: The Results Are In! As the BI market continues to evolve from its IT-centric roots to being heavily driven by lines of business, customers are demanding more. TIBCO Spotfire has received one of the top four scores across all use cases, and received the highest score for Decentralized Analytics! We believe our success can be attributed to our focus on developing a data discovery solution that’s meant to grow with an organization's needs. While there are many products out there for creating simple charts, Spotfire offers analysts a comprehensive, scalable platform for business intelligence. Don't let your BI investment hold you back. Get the whole report and discover how you can #MoreWithSpotfire!